The purpose of this document is to illustrate the steps needed to get SOLR configured properly for use with a nopCommerce instance with DevPartner Search extension. 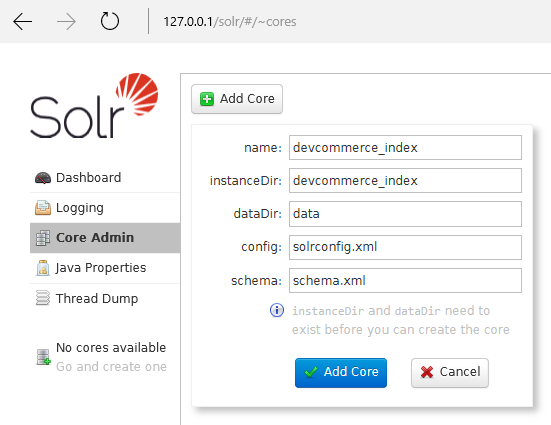 Step 1: Install SOLR via Bitnami as described here. Step 3: Copy default files from \Plugins\DevPartner.Misc.Search\SolrConf folder and past them(with replace action) in the devcommerce_configs (C:\Bitnami\solr-x.x.x-x\apache-solr\server\solr\configsets\DevCommerce_configs). Step 4: Copy the devcommerce_configs (C:\Bitnami\solr-x.x.x-x\apache-solr\server\solr\configsets\devcommerce_configs) folder and paste it in C:\Bitnami\solr-x.x.x-x\apache-solr\server\solr. Rename it to the index you are setting up, which, for this tutorial, use devcommerce_index. Step 6: Go to Core admin, press Add core and fill name and instance dir with the name of the index being added (from Step 4 above), in this example use devcommerce_index. To check if anything is getting into your index. 2. specify solr settings and click save button. 3. rebuild index by clicking Reindex button. 4. run schedule task to add documents to index by clicking Execute Crawler button.